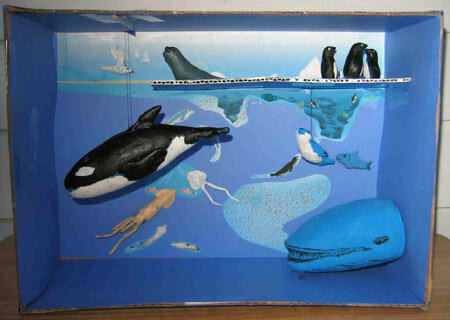 Make a 3-D ecosystem model. Go to Deeper Discovery and click on “Antarctic Ecosystem.” Read the information, then click on “Learn more.” Click on Ecosystem. Again, read the information. Now click on both Summer and Winter Ecosystem interactives, and click on various red dots to understand the overall picture. Your task: Choose one season and construct a 3-D model based on the picture. (A shadow-box is one suggestion). You need to include seven different organisms in your model. Label each organism in some way (example: with flags) and then attach a description sheet of each organisms role in the ecosystem. You can use information from the boxed descriptions on the web site, but put this in your own words. This worksheet activity was sent in by Carolyn Sheild from Jonas Clarke Middle School in Lexington, MA. The models were created by 7th grade students.